Get a bird's eye view of Mumbai and its coastline on this paramotoring experience from Vasai, north-west of Mumbai. This huge green belt is dotted with coconut trees, churches, temples, bungalows and many water bodies. Panoramic views of over 15 KM of coastline on the west. Scenic views of the Sahyadri range of mountains in the east, Vasai villages amidst the green cover of palm and coconuts trees, banana plantations and vegetable gardens. Service of an experienced pilot who will accompany you during the flight. The morning weather is very pleasant in this area. Enjoy the view from the front seat, with an experienced Aero Sports Pilot in control of your flight. During the entire sequence of takeoff, flying and landing you are seated comfortably while enjoying the unique experience of free flight. Your hosts ensure safety by being meticulous with our airworthiness checks of equipment and preflight checks. The flights are performed in calm and laminar winds only. The risk factors are minimal as you get airborne only after the wing is fully inflated. Once airborne you are suspended below the canopy which is capable of bringing you down safely even if there is engine failure in a worst-case scenario. We always fly with landing zones in our glide ratio. You will have to report at a location in Vasai, Maharashtra which is about a 1.5-hour drive from Mumbai centre. Upon your arrival in the reporting address at the time selected while booking, you will be meeting your hosts of the day. You will be briefed about the safety protocols and explained the equipment. After you are ready, you will be harnessed to the paramotor along with your pilot. After the takeoff, you along with the pilot will be in the air for approximately 10 minutes. During this time you will get to witness the mesmerizing bird-eye views of the surrounding environs. After the flight, you will be landing back safely and be unharnessed. You may head back to your onwards destination after the completion of your experience. Equipment required for the paramotoring experience. Service of an experienced pilot. Charges of the 10 minutes flight. Any transportation to reach the reporting location. Members below 8 years of age are not allowed for the activity. Members of 8 years of age or above will be charged at the adult pricing. The minimum weight limit is 25 kilos and the maximum being 80 kilos for this Paramotoring experience. You need to wear T-shirts, full pants (No saree/skirts), shoes (no chappals) and a cap. You may also carry sunscreen, glares, snacks and water bottle and a camera to take pictures. Avoid flying immediately after taking food. Leave at least 1-2 hours of a gap. We recommend participants with heart ailment and epilepsy to consult medical advice to do the activity of paramotoring. Paramotoring is a wind dependent sport and there’s a possibility of last minute reschedules or cancellations, which are beyond our control. 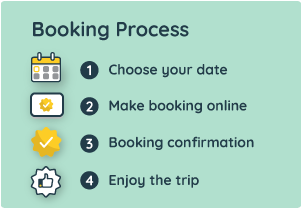 The local contact person details and phone number will be shared in the booking voucher, sent to you via email after booking.